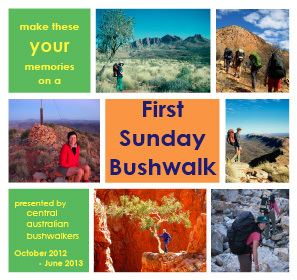 An easy-medium stroll east on Larapinta Trail stage 6 to cross the range at a low pass, then follow a bush track west to Ellery Creek. We finish with a 400 metre swim or float on a lilo across the cold waters of Ellery Big Hole. The walk is about 8km (about 2 hours). Sturdy, comfortable shoes; sunscreen, hat, long-sleeved shirt; small pack with water (3 litres), snacks, camera, personal first aid and medications. For the swim, bring bathers, heavy-duty plastic bags to waterproof your gear, lilo; and towel and sandals (can leave in the car). 7am at Stuart Park carpark (opposite the Memo Club on Gap Rd). We car pool and share petrol costs. For this walk it will be about $11 per person (excluding drivers). Please bring correct change. 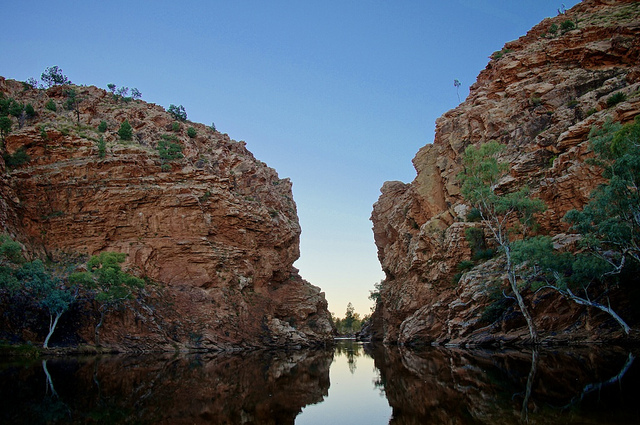 It takes about 1 hour to drive to Ellery Creek Big Hole from Alice Springs. We aim to be back in Alice Springs by lunch-time.